I am so very very proud of my Snickersdoodle Bear. I know Sassy was with us because while we were there I found a quarter 🙂 . What Canine in Costumes is a “parade” of dogs in costumes and an event to raise money for our humane society. This is the first year that I participated. I should have taken Sassy and Bosch but never did. It was a good time. Snickers minded her manners, never jumped on anyone and got along with all the dogs. She was more scared of them. I didn’t take Jasmine because the girls feed off each other’s energy plus I didn’t have anyone to help me. It was good for them to do something by themselves. We did paw prints, had our picture taken, listen to a pet behavorist, just walked around letting Snickers sniff different scents and being petted. AMAZING job Snickers!!! I would be scare of all those other dogs too! You look great in your costume and I know Sassy was watching and SO proud since she had hand-selected you and your sister for your mama! What a fun event, Michelle! 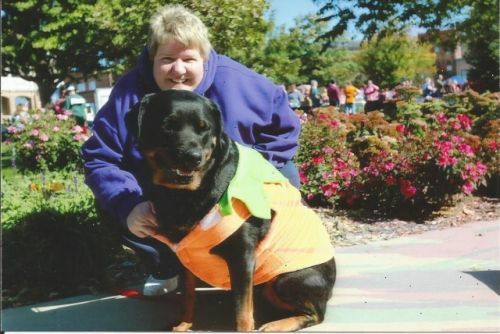 I love dog events and dressing up pooches … Shelby and I used to do that all the time. I worry about Jasper w/her growlies and fear of everything but we’ll get there. Did the pet behaviorist have anything interesting to say? That is a great photo of you two – you both look very happy and connected (and snuggly)! It really, really is a DELIGHTFULLY HAPPY photo of you two!! So much joy! Loving this whole post!! That sounds like such a fun day, and for a good cause too. And it is special that you and Snickers got to have some one on one time. She actually looks quite pleased with herself in the photo and very content as a pretty pumpkin! And Sassy was indeed there! And she was probably pretty tickled to be there without having to wear a costume! Snickers you are such a good girl.. but you already know that! Good girls deserve a scoop of ice cream!! Jazz and Bosch, you get a piece of pumpkin pie with whip cream for stayin home and being good. Thanks for sharing such a perfect day Michelle! We’re all smiling right back at ua’! Love that picture Michelle! Snickers what a beautiful pumpkin you make! Looks like it was a mighty fun day. What a great pic of you two! Sounds like an awesome day, I’m a little jealous. I could never take Nitro to such an event, because he’d embrace his inner Cujo and scare everyone away. This picture definetly need to be framed. Too cute! Both of you look so very happy, I’ll bet she was THRILLED to get a whole day with just you, lucky girl. I love that the fair had a behaviorist too, very cool.